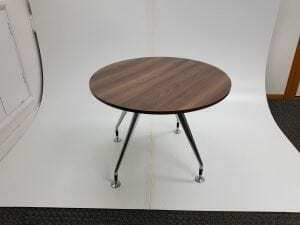 These high quality used Vitra walnut round meeting tables, complete with a chrome 4 splayed leg base, floor levelers on the legs and an interesting square edge detail on the table top. Diameter: 800mm. We also stock similar Vitra tables finished in white. Simply click on the link provided to view these products. Please contact one of our sales team on 07944 508282 for any further information. Alternatively, if you are viewing our website on a Mobile Device, you can click on the Telephone Icon located at the bottom of this page. If you are unable to call us, or are viewing our website during out of office hours, you can enter your details into our ‘Request a Quote Online Form‘ and one of our sales team will be in touch to assist you further. All these tables can all be viewed in our showroom along with all our other used office furniture. Chrome 4 Splayed Leg Base. Floor Levers on the Legs. Available to View by Appointment at or High Wycombe Showroom.